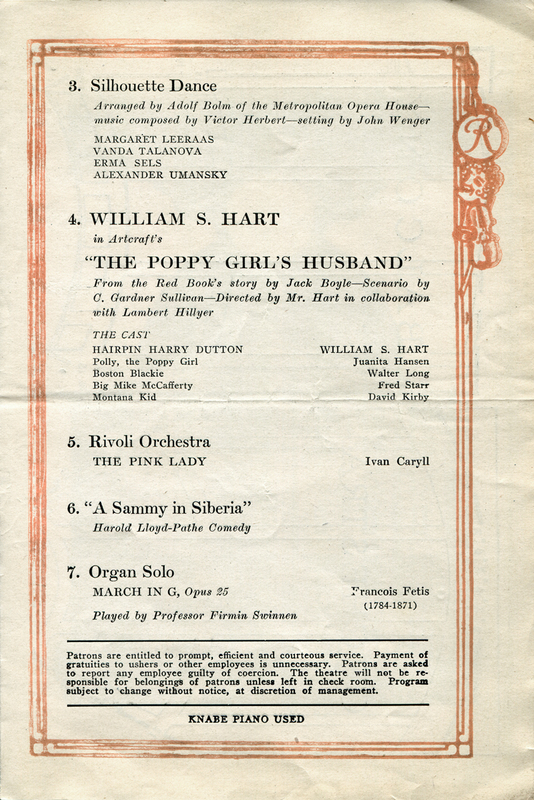 SCVHistory.com | William S. Hart | Rivoli Theatre Program: Broadway Premiere of 'The Poppy Girl's Husband' 3-23-1919. 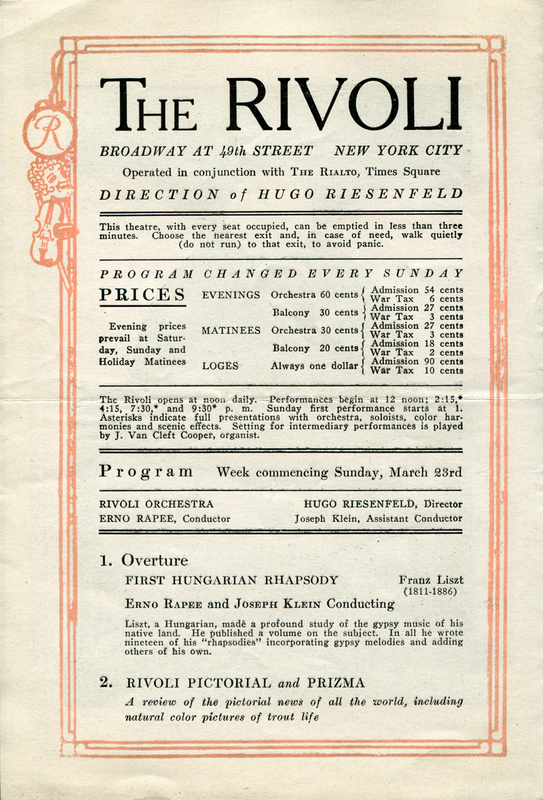 Rivoli Theatre program for the Broadway premiere of "The Poppy Girl's Husband," 3-23-1919. An Artcraft picture, "The Poppy Girl's Husband" was co-produced by its star, William S. Hart, and Thomas H. Ince (Famous Players-Lasky Corp, later known as Paramount). It was co-directed by Hart and Lambert Hillyer from a story by Jack Boyle published in Red Book Magazine, with screenplay (scenario) by C. Gardner Sullivan. It was released March 16, 1919. Critics praised Hart for this departure from his usual fare. 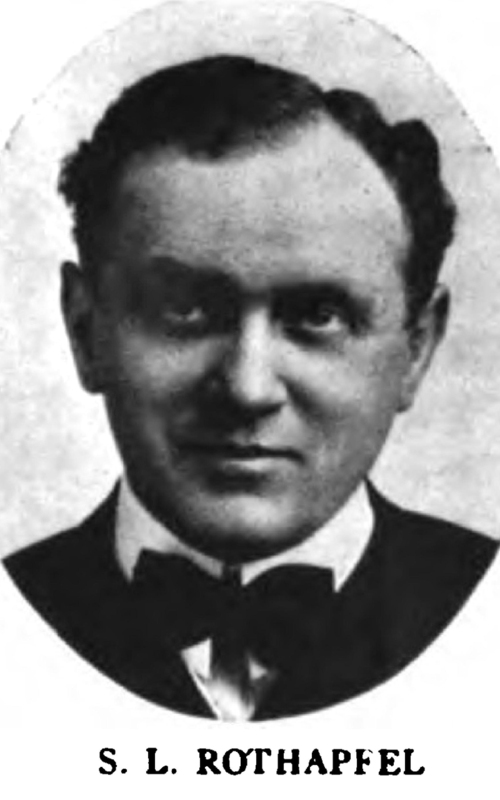 His character, Hairpin Harry Dutton, is paroled from prison to learn that his wife (played by Juanita Hanson), whose virtue Dutton had defended, has remarried. Turns out, he was wrong about her. The girl's new husband (played by Fred Starr) intends to frame him to get him out of the picture. Dutton sets out to exact his revenge, but his young son (with his former wife), played by Georgie Stone, persuades him to let it go. Rounding out the cast are Walter Long, David Kirby and Leo Pierson (uncredited). The Rivoli Theatre performance includes, in addition to orchestral and organ numbers and singing, a "nature" newsreel and a Pathé comedy, "A Sammy in Siberia," starring Harold Lloyd. 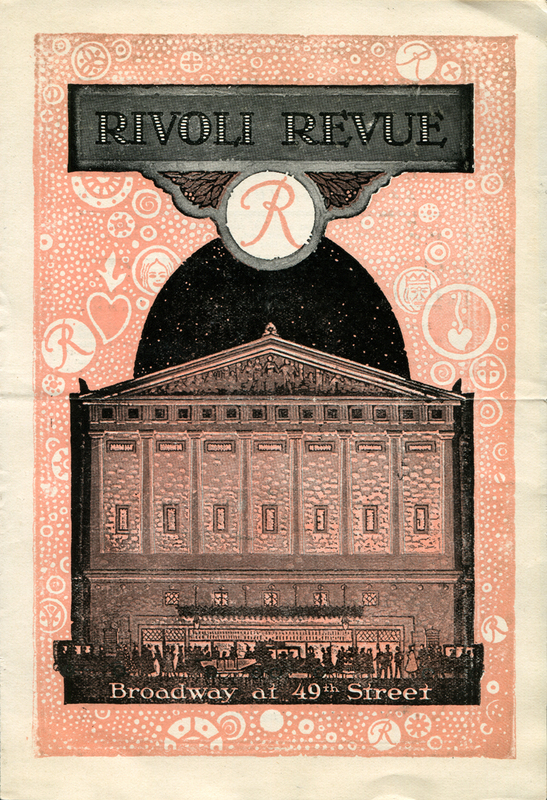 About the Rivoli and Rivoli Theatres. The Rialto and Rivoli theaters were sister movie palaces on Broadway that used a full orchestra and grand pipe organ to provide audiences with a complete program including a first-run feature film (often a premiere) plus comedic shorts and newsreels interspersed with musical performances. A new program, initially built around the latest Famous-Players Lasky (Paramount) release, debuted every Sunday. The 1,960-seat Rialto opened April 21, 1916, on the site of Oscar Hammerstein's former Victora Theater, a vaudeville venue, at 1481 Broadway (corner 42nd Street). With its success, on December 28, 1917, owners Crawford Livingston and Felix Kahn opened a second theater, the 2,270-seat Rivoli, a Greek revival building designed by Thomas W. Lamb at 1620 Broadway (corner 49th). Its first show featured the Douglas Fairbanks film, "A Modern Musketeer." Livingston and Kahn hired S.L. "Roxy" Rothapfel (of later Roxy Theatre chain fame) to run both palaces. Shows ran five times daily. Loge seating was 60 cents at the Rialto and $1 at the Rivoli; general admission was 60 cents; 30 cents for evening performances and matinees (prices include War Tax). 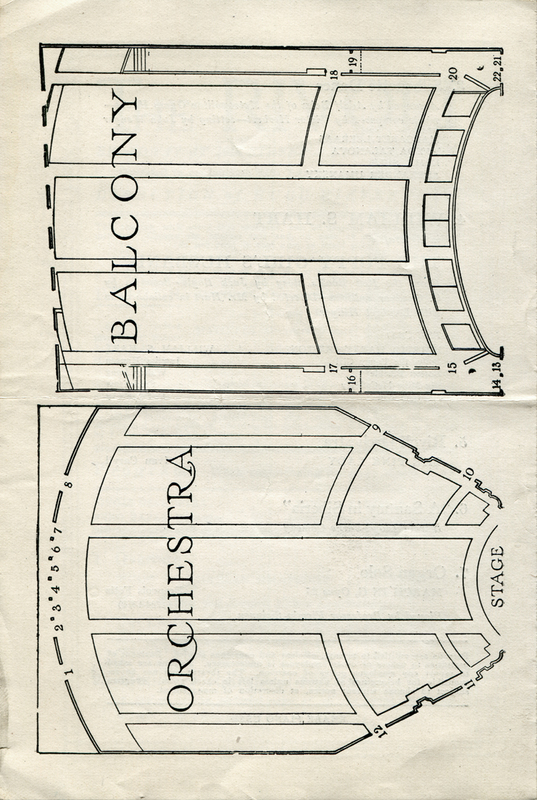 The Rivoli had a 50-piece orchestra, and once a week, the show featured the combined orchestras from both theaters. Music was considered central to the program. The Rialto initially used a grand pipe organ built in 1916 by the Austin Organ Co. of Hartford, Conn., Opus 611, which was billed as the largest organ ever installed in a motion picture theater. It was replaced with a 1922 Wurlitzer Opus 520. The Rivoli started with a 1917 Ausin, Opus 709, and replaced it with a 1924 Wurlitzer, Opus 839. In 1926, Paramount built its own eponymous theater on Broadway, and it also controlled the Criterion. There wasn't enough Paramount product to sustain four theaters, so the Rialto and Rivoli started to run films from other distributors. The Great Depression killed the Criterion and the Rialto; the latter closed in 1935 and was rebuilt on a smaller scale. In the 1970s it became an adult movie theater, then switched to live theater in the 1980s and was used as a TV studio before being demolished in 2002 to make way for a high-rise office building. 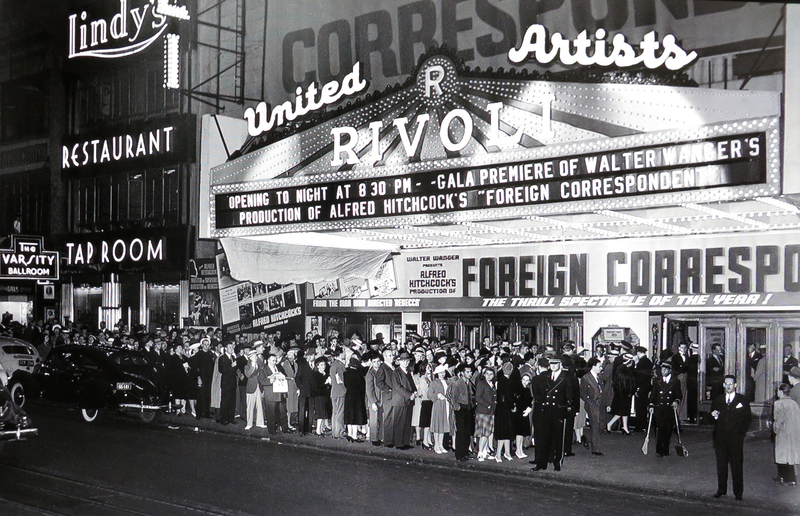 Meanwhile, the Rivoli remained one of New York's finest roadshow theaters (a theater that shows limited-release films prior to the general release). In 1955 the Rivoli was converted to a 70mm Todd-AO cinema with a deeply curved screen and six-track stereo sound for the world premiere of Michael Todd's "Oklahoma!" Some of the other 70mm films to premiere there were "Around the World in 80 Days" (1956), "West Side Story" (1961), "The Sound of Music" (1965), "Hello Dolly" (1969) and "Fiddler on the Roof" (1971). In 1963, an Egyptian façade was added to the building for the premiere of "Cleopatra." The façade stayed until the 1980s when it was altered to prevent the building from being designated a landmark. In 1981 the curved screen was removed, and in 1984 it became a United Artists Twin theater. UA closed it in June 1987 and the building was demolished in favor of a black glass skyscraper. 19200 dpi jpegs from original program purchased 2014 by Leon Worden.